We offer our full handyman services throughout Bacup, even though it is just over the border of Greater Manchester, Marc, one of the team of handymen lives there so he will pop out and see you. Our experienced handymen are able to carry out most of your household jobs, the only work they can’t is gas work and some electrical work which requires a qualified electrician, other than that we will be happy to provide you with a no obligation quote, giving you a fixed-price for the work we will be carrying out. All of our handyman team have many years of experience with general repairs and building work and work to the highest standards to you are happy with our work in the hope that you will reuse us and recommend our handyman services to your friends and family in and around Bacup and Rossendale. Depending on the job our handyman may give you a couple of different price options, for example, if you want a kitchen or bathroom fitting with a view to renting a property out then you may not require the same standard of quality of finish as if you were fitting your own home out. We won’t ever carry out a job that isn’t up to standard but we can show you some ways you can reduce your spend on a project. We work with all our customers to make sure we carry out your work quickly and efficiently and minimise the disruption of your day to day routine. We know living on a practical building site is no fun so if we are working on a job which we take a few days we will make sure the area is left as clean, tidy and useable as possible to create minimum disruption. Some people find this website by searching for terms such as ‘handyman bacup’ or ‘handyman rossendale’, look through what services we provide and if they don’t see the one they want carry on their merry way to find a handyman site which does list it. The truth is, the range of repair services we offer and range of work we carry out is far too much to list on this website and if we did list everything doubt you would ever find it as the list would be so long. To get to the point, we can carry out the majority of household, domestic, and office repairs, maintenance and installation you can think of. We do it to a very high standard and with a very competitive price. 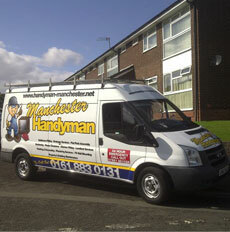 If you want to check we can do the work you want please pick up the phone and call us on 0161 883 0131, we know it’s a Manchester number but that’s just where the unit is, the person that will come to see you , Ken, is from Bacup in Rossendale and can look over all the handyman services you want pricing. We cover the majority of the Greater Manchester area including bolton, Stockport, Tameside, into Cheshire. See below for a full ist of the areas we cover. Call 0161 883 0131 for a quote.